Normally when a person suffers an injury as a result of another person’s mistake or wrong doing, that injured party has the right to file a lawsuit. Sometimes, an injured party has a right to join a lawsuit that involves a large group of people. These types of lawsuits are commonly referred to as class action lawsuits. In these cases, the party who filed a lawsuit must be able to adequately represent the interests of all those who were also allegedly injured by the actions of the defendant. 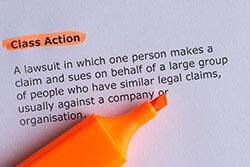 A court must certify a class action lawsuit. In order to be certified as a class, two main criteria must be met. First, all the questions of law or fact in dispute must be common to all plaintiffs in the class. That means that if a case requires that a plaintiff prove facts specific to his or her own case, it should not be included in the class. Second, the number of plaintiffs must be large enough to make it impractical to try each case individually. That number varies and will be decided on a case-by-case basis. The point of the class action is to maintain judicial efficiency. The court system would be bogged down if every single person who purchased a drink with an improper label filed a separate lawsuit claiming unfair business practices. The legal costs to the defendant would be obscene. The logistics of bringing the same witnesses to court to testify over and over again would be impossible to deal with. Class action lawsuits also serve to hold companies accountable for small mistakes that affect many people. A company that practices deceptive advertising may only trick each consumer out of the price of one of their goods, hardly worth a lawsuit, but when hundreds of consumers band together to enforce their rights, justice is better served. Once a group of individuals files a lawsuit against a defendant for an alleged wrongdoing, they are responsible to seek out other people who might have been affected and offer them an opportunity to join the class. Each individual can choose whether to join the class and accept the settlement presented to the entire class, or to preserve his or her own right to file his or her own lawsuit. Common class action lawsuits include suits resulting from an environmental disaster such as an oil spill, prescription drugs with unforeseen side effects, defective products, misleading advertising, price fixing and price gouging, securities fraud and employment discrimination suits.